Unicycle Rose: Scared, Unprepared, Laid Back or Clueless? Scared, Unprepared, Laid Back or Clueless? I couldn’t help but chuckle when I went to the Camarillo marathon website to nail down the race course for Sunday … I printed the map and then noticed there is a gal that keeps a blog all about her experience preparing for her second half-marathon, which is the same one I am preparing for. Yes, that one that's a mere four days away! Curious, I visited her blog. She outlined what she is doing this week to mentally and physically prepare for those 13.1 miles of exercise. She mentioned everything from her training program that includes Chi running form focuses, being sure to get eight hours of sleep, a particular diet that is supposed to help her out on race day and laying out what she is to wear (a shirt with her blog logo on it, of course). She even knows what she is eating for breakfast the day of the race … grain bread with almond butter. Can I tell you that I have not considered any of this? Pondering answers to those questions, I sat back and laughed at myself. Please note that I drank two glasses of wine last night and did not stop to think if it would cause unicycle fallout days from now. My diet is far from that of a health nut … working in second grade I may as well work part-time in a bakery. Students bring in home-baked goods regularly, not to mention free donuts in the Resource room on Fridays. Why, just today I bought a jumbo package of mini-pumpkin muffins from Sam’s Club. Now I am feeling unicycle guilt for writing out this truth. 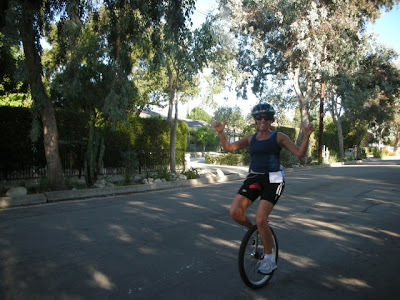 Was I supposed to transform into a health nut because I am crazy enough to unicycle a half marathon? On my behalf, I do insist on eight hours sleep and eat a solid breakfast, but as far as wardrobe? I know I will be wearing my unicycle diaper and shoes/socks on race day. Don't worry, there will be more clothes on my body, but I am not sure what ... I should create a UnicycleRose.com shirt so I can advertise what a minimally-prepared-light-hearted-mom-goof-athlete-blogger looks like. I might be in for a surprise on Sunday, as my can slips and slides in the saddle, soaked in sweat about mile nine. All this while I'm gasping for air and dripping in my own juices ... smiling all the way ... so, who cares if I am scared, unprepared, laid back or clueless? I choose to live like I'm alive! Congrats to Aorta, the nurse!